Tis the season of cold and flu’s floating all over the world. 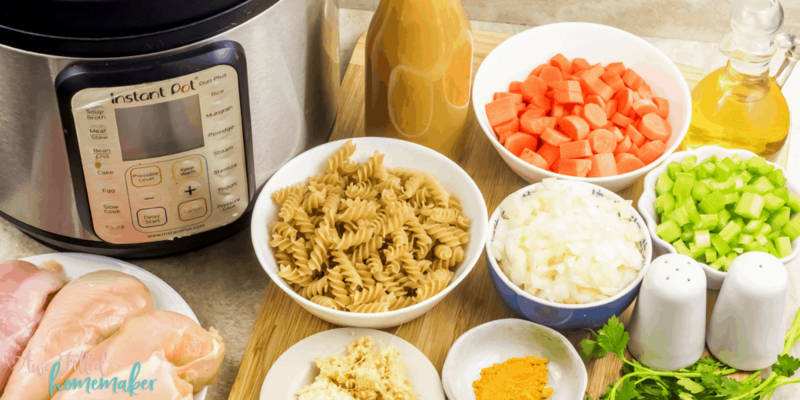 For that, I make sure to keep all my ingredients on hand for my Instant Pot Flu Fighting Chicken Noodle Soup. 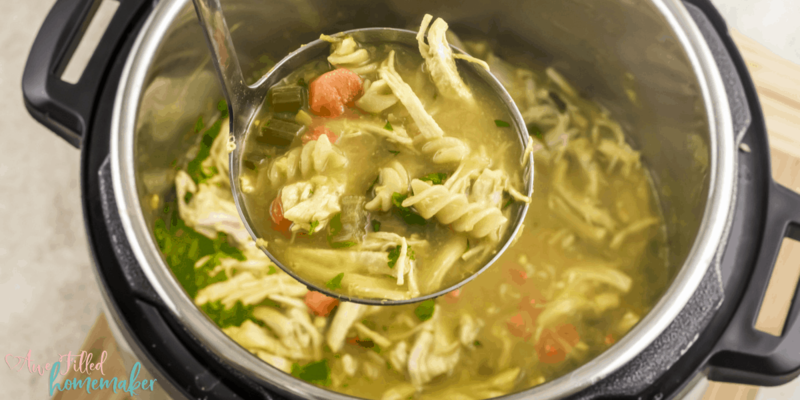 This soup is made with tender and juicy chicken, gluten-free pasta, a handful of spices, and veggies. This soup is packed full of ingredients to fight that flu. 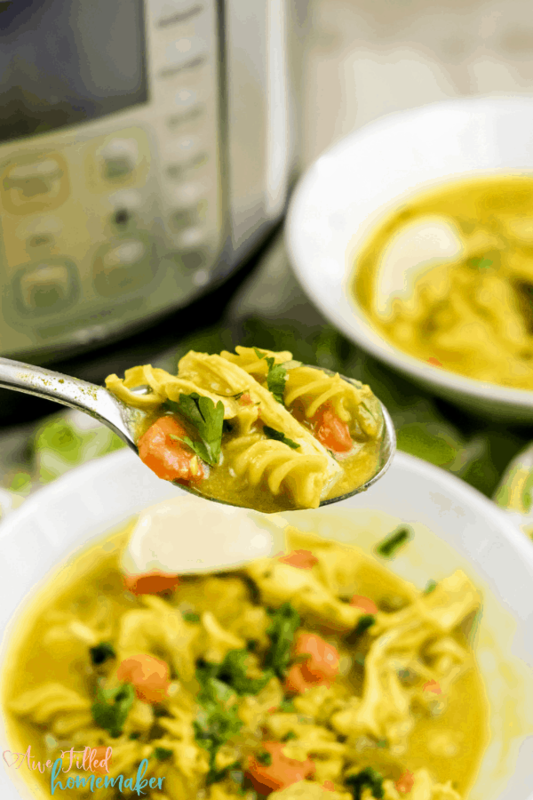 Food is fuel and that is what you get with my flu-fighting chicken noodle soup. 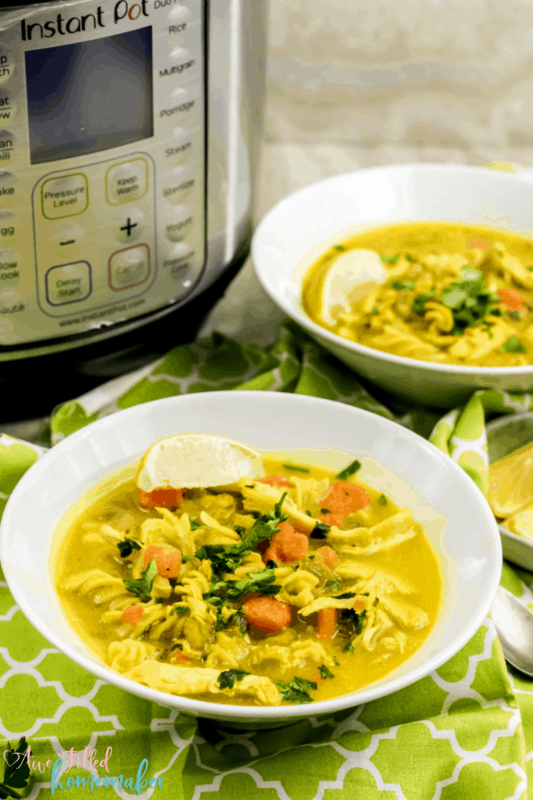 With the arrangement of spices, broth, and vegetables, it works together to fuel your body to fight off the flu, but also to fuel you to get through the day. So how is this soup a flu fighter? Let me share some of the health benefits of the ingredients. Tumeric and Ginger | Both of these are excellent anti-inflammatories. You will find that ginger is terrific for soothing an achy throat and settling an upset stomach. Tumeric also has antioxidants to help boost your body to fight off the flu or cold. Lemons | Serving with lemons is a great way to add in a little extra Vitamin C into your diet. Vitamin C is essential for fighting the flu. 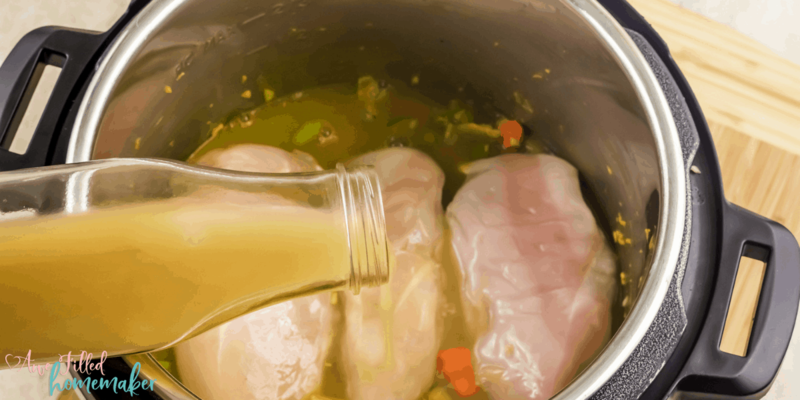 Chicken Broth | An anti-inflammatory and can help reduce joint pain. We know how bad our body aches when getting attacked by the flu. Garlic | This white gem is excellent for adding flavor to your dinner but also helping your body to flush out any viruses or bacteria that might be lingering within. 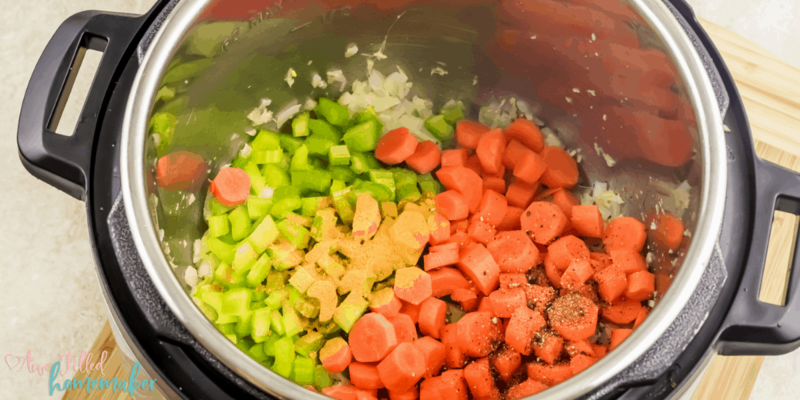 Carrots And Onions | Both work great at fighting the flu. Carrots have beta-carotene which is great for tackling respiratory infections. 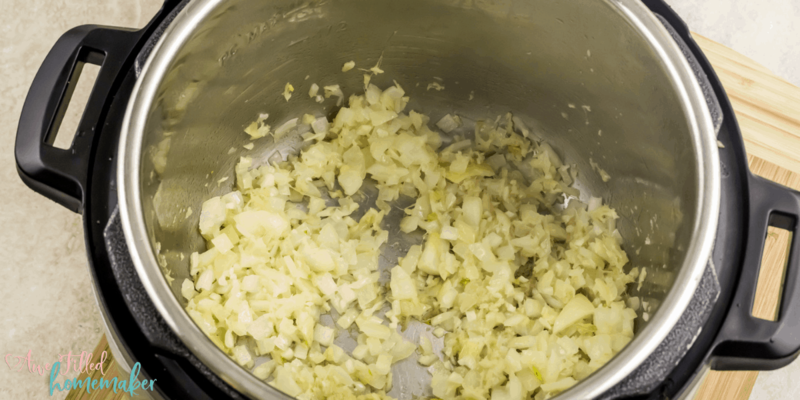 The onion in the soup works at fighting off the viruses in your body similar to the garlic. Yes! Warm soup is helpful for breaking up any congestion. The ingredients are packed full of vitamins and minerals to tackle the virus. Plus, chicken noodle soup is easy on the stomach. I use a handful of spices for my soup. These spices add a lot of health benefits, but also flavor to the soup. I reach for fresh ginger (you can use ground in a pinch), parsley, turmeric, and salt and pepper to taste. 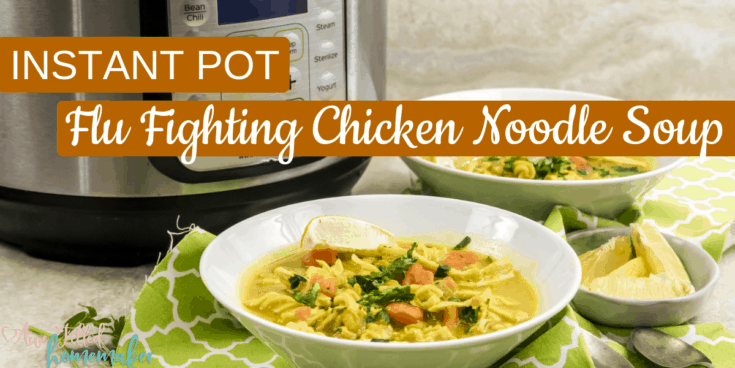 Follow my recipe and it will lead you down the path to the best chicken noodle soup recipe. If you don’t follow a gluten-free diet, you can use regular noodles to replace. Either way, this soup is outstanding in flavor. 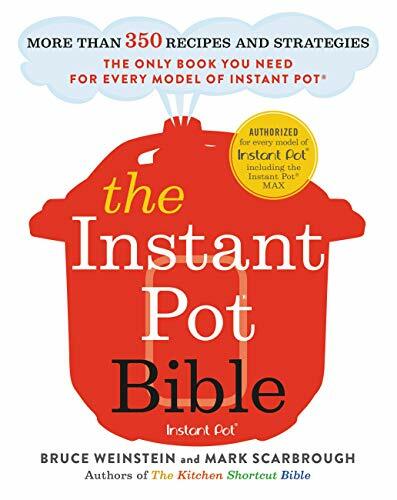 1) Start out by turning the Instant Pot on the ‘Sauté’ mode. 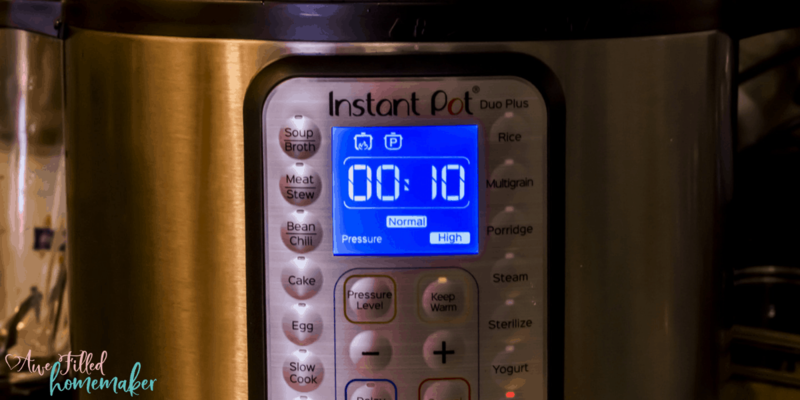 You will want to let the Pot heat up for 2 to 3 minutes or until the display shows ‘HOT’. 2) Next add the oil or butter followed by the chopped onions, grated ginger and minced garlic to the leftover bacon fat. 3) Continue to Sauté for another 4 to 5 minutes or until the onions caramelize. 4) Add the celery and the carrots, along with ground turmeric, salt and freshly cracked pepper. Make sure you have mixed it up well. 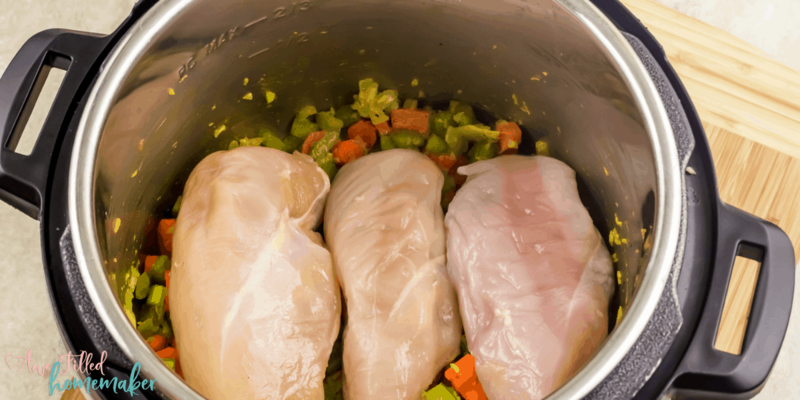 5) Place the chicken breasts over the vegetables. 6) Add the chicken stock. 7) Turn off “Sauté” mode. Secure the lid, ensuring the pressure valve is in the “Sealing” position. 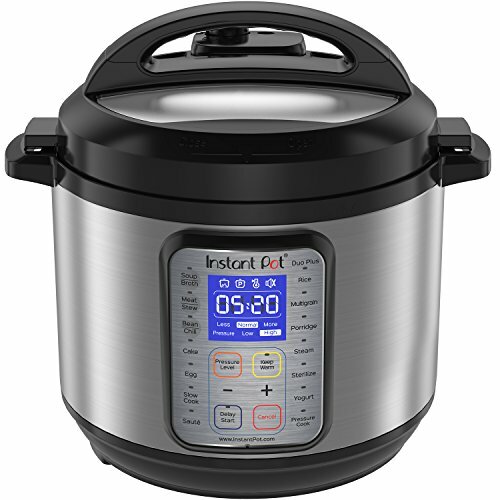 9) When Instant Pot beeps, let the pressure release naturally. 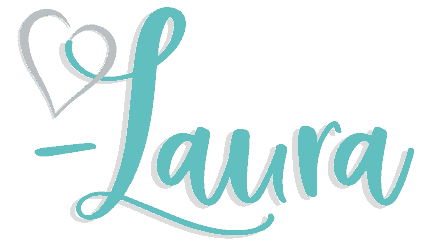 It is super important to allow this to release naturally. 10) Remove the chicken breast and shred it with two forks. 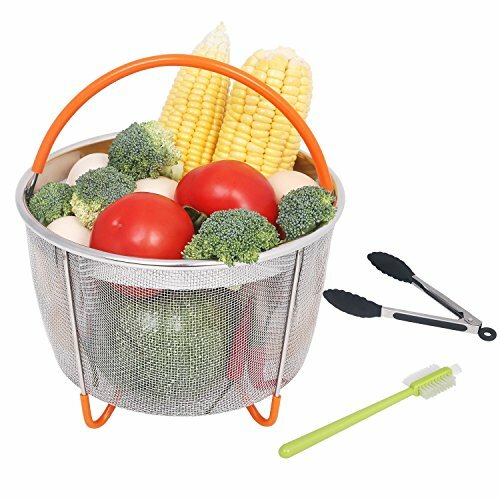 In my experience, chicken that has been pressure cooked shreds by fork super easily! 11) Turn on the “Sauté” mode and add the cup of pasta. Let it simmer for 6 to 8 minutes or until it is cooked. 12) Midway though the pasta cooking you want to add back the shredded chicken along with chopped fresh parsley. Continue to simmer till the pasta gets completely cooked. 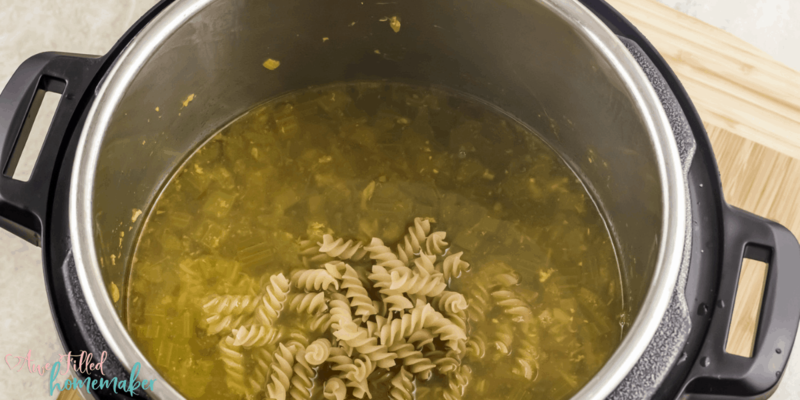 Note: The starch from the pasta will thicken the soup. 13) Check for seasoning and adjust the salt and pepper according to your preference. 14) Serve piping hot, with a generous squeeze of lemon and a handful of freshly torn parsley. Don’t forget- lemon is excellent for healing! Turmeric and ginger are both anti-inflammatory. Ginger also sooth as sore throat and helps upset stomach. Fresh ginger is the best. But in a pinch add ½ teaspoon of ground ginger. The Vitamin C form the lemons also helps with the flu. 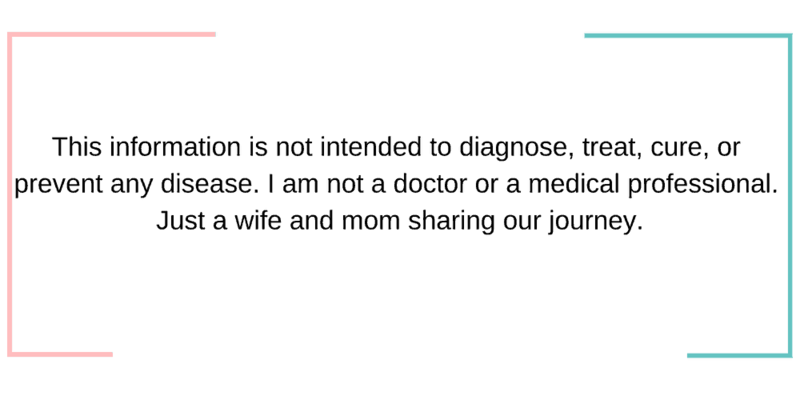 So you CAN skip it, but it will help you fight the flu better if you don’t. 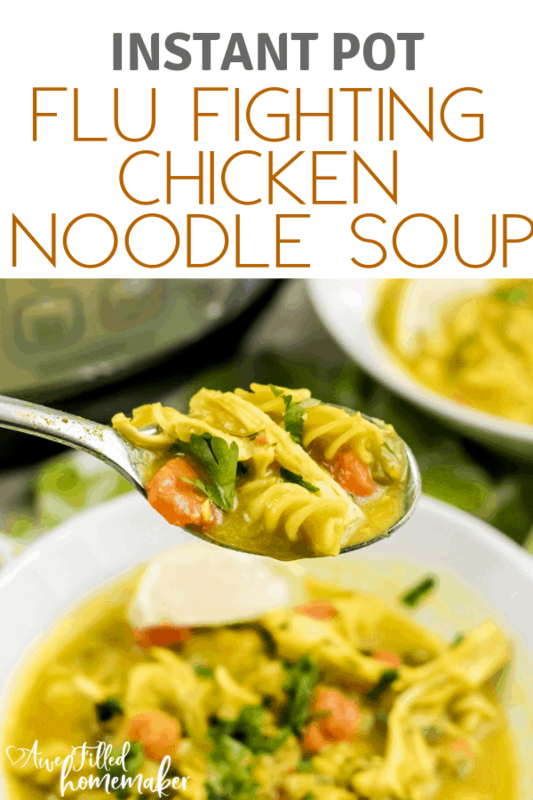 You may be wondering- why did she decide to call this my flu-fighting chicken noodle soup? Well, look at all the nutrients you get from all the herbs and veggies, not to mention the healing properties in the other ingredients too. Trust me, make this recipe when you are sick or want to try to boost your immunity and protect yourself against getting run down. 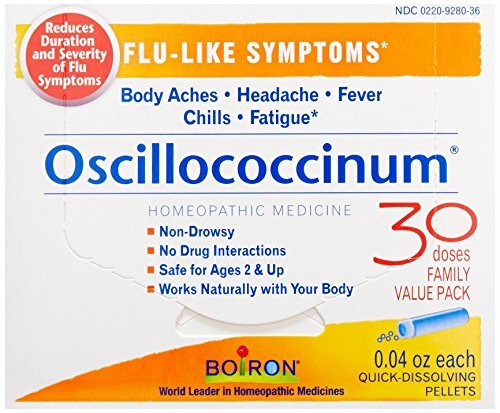 We use this recipe every year and, let me say, it works great at helping protect our family and get us on the mend faster if we do get hit with the sickness. Also, my kids love this! So kids tested, that’s a win win! 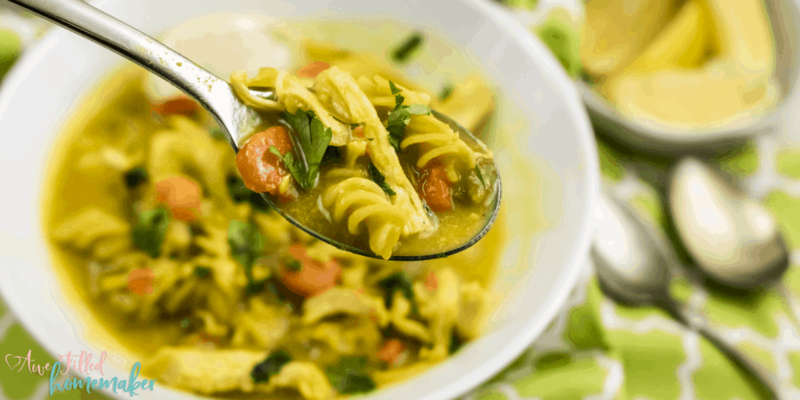 This soup is made with tender and juicy chicken, gluten-free pasta, a handful of spices, and veggies. This soup is packed full of ingredients to fight that flu. Add the oil or butter followed by the chopped onions, grated ginger and minced garlic to the leftover bacon fat. Sauté for another 4 to 5 minutes, till the onions caramelize. Next add the celery and the carrots, along with ground turmeric, salt and freshly cracked pepper. Give it a good mix. Place the chicken breasts over the vegetables. Remove the chicken breast and shred it with two forks. Turn on the “Sauté” mode and add the cup of pasta. Let it simmer for 6 to 8 minutes or until it is cooked. 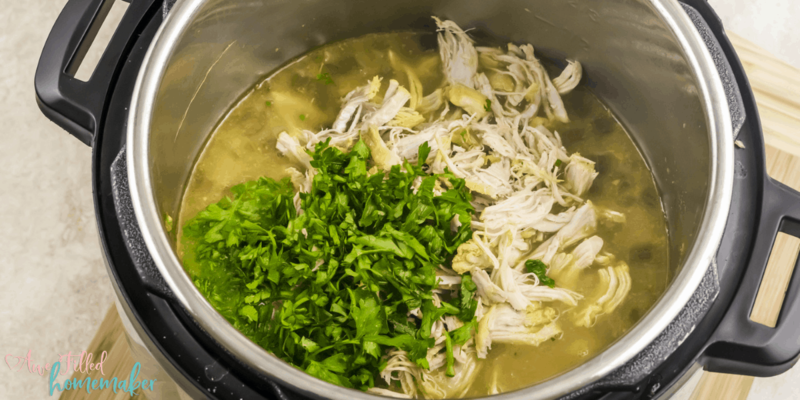 Midway add back the shredded chicken along with chopped fresh parsley. Simmer till the pasta get cooked. Check for seasoning and adjust the salt and pepper accordingly. Serve piping hot, with a generous squeeze of lemon and a handful of freshly torn parsley. Turmeric and ginger are both anti-inflammatory. Ginger also sooth as sore throat and helps upset stomach. Fresh ginger is the best. But in a pinch add ½ teaspoon of ground ginger. The Vitamin C form the lemons also helps with the flu.